Medical cannabis is quickly gaining traction thanks to the legalization of cannabis for either recreational use or medical use in various states throughout America. CBD is one of the main cannabinoids of the cannabis plant, and it’s the one that holds the key to many incredible medicinal properties. CBD Essence claims to be one of the leading companies when it comes to the CBD manufacturing industry, and the company is committed to supplying natural alternatives in comparison to the traditional medications that many people rely on. Let’s take a look at this company and see if they have what it takes to deliver. The CBD Essence specialty is CBD oil, but they also sell topicals, edibles, pastes, and even pet care products. The company uses a unique extraction process which involves a state-of-the-art technology that they are proud of, and this ensures the end product is rich in cannabinoids and other natural hemp compounds like terpenes and flavonoids. They claim to use rigorous lab testing that ensures their tinctures are extracted from only the highest quality plants, with an end product that is not only effective but also reaches maximum potency. Also, as part of the NutraHemp Corp CBD Essence is based in St. Petersburg, Florida. The site claims to sell products that are 100% THC free and ideal for a wide range of medical conditions. Let’s dive into some of their most popular products, and then you can decide for yourself if this is a brand worth trying. The CBD tinctures are one of the company’s best-selling products. They only sell one type of tincture, which is available in two sizes: 1 oz, and 2 oz (the 1 oz consists of 300 mg of CBD and the 2 oz has 600 mg). The 1 oz bottle currently goes for $44 and the 2 oz for $79, and they also offer the option to purchase 4x 1 oz bottles for $132, which would give you a savings of $44 (so you essentially get one for free). On their website, CBD Essence states that the tinctures have been their flagship products from the very beginning. They claim to use the “essence” of the plant, with each bottle containing a full spectrum of cannabinoids, essential oils, terpenoids, and other compounds that originate from the original hemp plant. Also, the tincture oil blend is specifically formulated to be absorbed in the mouth – for best results, you can hold the oil under your tongue for 1-2 min. For the fullest effect, you’ll want to hold it in your mouth for as long as possible. If you experience excessive salivation before swallowing, you can take fewer drops more often. The tinctures are reported to have a very efficient calming effect and can make users feel more relaxed in a matter of minutes. It’s also effective for treating chronic pain, however, the process typically takes significantly longer. Grown sustainably without any pesticides, the Hemp Taffy range of CBD Essence originates from a 100% safe, non-GMO, full-spectrum CBD oil as claimed by the company. They offer a Chocolate Hemp Chewy Taffy that can be purchased in quantities of either 0.5 oz, 1 oz or 2 oz. The 0.5 oz pack consists of 36 pieces of taffy (with 10 mg of CBD per piece), and will set you back $34. The other edible option is a Peppermint White Chewy Candy, which are also available in quantities of 0.5 oz, 1 oz, and 2 oz. The 0.5 oz pack consists of 41 pieces, and like the hemp taffy also contain 10 mg of CBD per piece ($36). The best thing about the taffy is that you can eat it – and enjoy it – as you would any other sweet, except this one will make you feel calm and relaxed. Certainly a much tastier CBD experience than simply placing oil drops under your tongue. Most marijuana edibles that are on sale contain high levels of THC, but CBD Essence is a market leader in CBD-rich edibles that contain virtually no traces of THC. Even better, the effects kick in almost immediately after consumption. These cannabis-infused edibles are healthy and wholesome and could easily find a way into your daily diet. They’re also great for stress and social anxiety. In fact, one consumer stated that she gets very stressed in social situations when she needs to interact with people, and finds the taffy to be very effective in calming her nerves. CBD Essence offers two options when it comes their topical products: CBD Active Sport Hot Muscle Rub and CBD Active Lifestyle all-purpose lotion. Both of these creams offer incredible joint and muscle pain relief, or at least so we hear. The Active Sport option delivers deeply penetrating effects and is combined with a moisturizing skin cream that provides a long-lasting natural warming sensation that is sure to soothe body parts in pain. The Active Lifestyle lotion is infused with Eucalyptus and Cannabidiol extracts that are combined with a moisturizing skin cream, thereby ensuring that you won’t be left feeling greasy or smelling like a locker room. Unlike the CBD oils, these topicals use supplemental ingredients that include various extracts such as lemon eucalyptus oil, vegetable glycerin, and shea butter amongst other things. The best method of use is simply to have someone (or yourself) rub it into the affected area. It’s used just as you would any other muscle rub. The best place to purchase your CBD essence is directly on their website. They offer free UPS priority mail shipping on all orders over $75, and a $5 flat rate for shipping everything else. The website is super user-friendly, and they have provided several ways for you to contact them directly if you have any questions. While they don’t offer as much of a selection as some other brands, CBD Essence caters to all CBD needs, offering everything from capsules, edibles and tinctures to topical creams and pet care products. 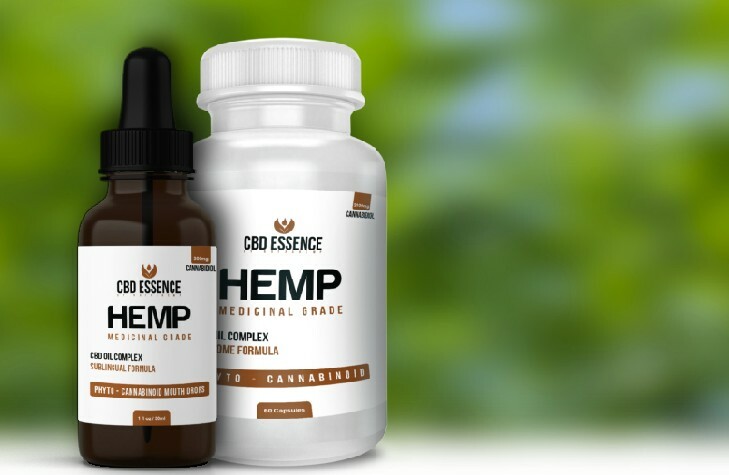 Also, since CBD Essence is part of NutraHemp, a large and reputable company in the industry, their CBD products are only of the highest quality. This is definitely a brand worth trying, and who knows – you might just find your new favorite product.